This is, hands down, my favorite fall dinner. I know everyone in the food blogisphere is writing about pumpkin, apples, and butternut squash (which are all delicious), but I love pork loin and tenderloin. Pork loin is great roasted in the oven in the fall or winter or smoked on the grill in the summer. It's affordable (as low as $.99/lb. on sale), it's lean, and it cooks relatively quickly. It's just as versatile as chicken, but it's jucier. So juicy, in fact, that it doesn't need any gravy or sauce. Now E may tell you that he's sick of pork loin. He jokes with me because I love it so much that I stock up on it. I make it at least three times a month once the weather gets cold. He's right. But I'm the cook, so I get to choose the menu. I love this recipe because it has the perfect balance of salt, fresh herbs, garlic, and spice. 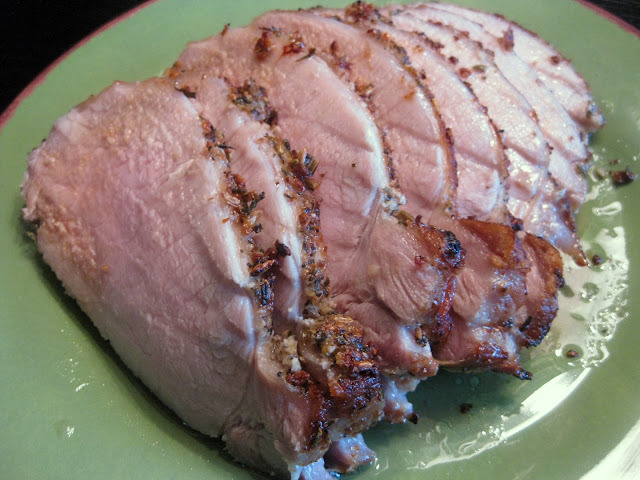 The pork develops a crunchy, highly seasoned exterior, but remains juicy on the inside. It's perfect with a fall vegetable and mashed potatoes or cornbread stuffing. The leftovers are great on a soft potato roll as a sandwich. Trust me, this is a crowd pleaser. I picked up this 10 pound pork loin on sale at ShopRite for about $12. I cut it into 3 smaller loins, wrapped and froze two of them and cooked a 3 pound piece for dinner. This was super easy to do (I'm sure you could ask the butcher at the grocery store to do it for you) and it was a great deal. Next, I combined herbs, salt, pepper, fennel seed and garlic in my food processor to create a thick paste. Make sure you use fresh herbs. They cost a bit more (although I still have some growing in my garden), but this recipe won't be the same with dried herbs. Also, I use kosher salt for all of my cooking because it doesn't tase as salty as table salt. I spread this paste all over the pork loin, placed the pork in a zip-top bag, and let it marinate in the fridge overnight. When it was time to roast, I preheated the oven to 400 degrees, placed the roast in a pan and cooked it about 45 minutes. I served it with cornbread stuffing (a recipe in progress for a future post) and brussels sprouts. Rinse and dry the pork loin. Combine the rest of the ingredients in a food processor (or mince by hand) to form a paste. Rub the herbed oil paste on to the pork, place the pork in a zip-top bag, and let marinate in the refrigerator for at least 12 hours. Preheat oven to 400 degrees. (I have a convection oven and I use the "roast" setting.) Remove pork from the refrigerator 30 minutes before cooking. Line a baking sheet or roasting pan with foil, place the pork fat side up on the pan and bake for 45-50 minutes or until a meat thermometer inserted into the center reads 145 degrees (160 is the recommended temperature for pork, but I like mine at this temperature.) Let the pork rest for at least 20 minutes before slicing thinly and serving. This looks so good! I usually just make pork chops but I know that the tenderloin/loin is so juicy and tender and I NEED to make something using that. Looks like a nice crust on it :) Definitely trying this one! Thanks for sharing! i need to invest in a meat thermomenter, cuz this is going on the list! This looks great! I love all the herbs in the rub...yum! This look so yummy, the juices, yum!! YUMMY! Pork tenderloin is a favorite of mine. It's just so good! I need to get some fennel seeds but I am going to make this one. I've also been craving cornbread stuffing so I'm all ove rhtis meal. Happy Fall! I very much enjoy preparing pork tenderloin. I love how succulent this looks. And perfect for the season.